Perfect for the sport moms,sport families,sports fan,sports team or anyonge,Excellent gift idea! Large enough to fit all of your things and even extra clothes for a long day at the ball fields or court.It is also perfect for travel,shopping,daily using,school life and more. 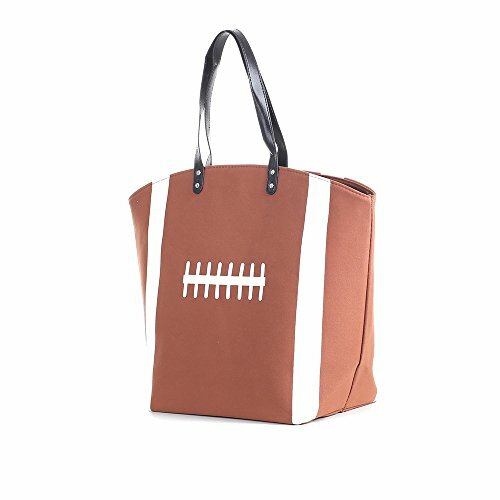 Football tote bag dimensions: 23'' x 17" x 7",Extra large size utility tote bag. Pretty and fashionable sports fan tote bag-baseball tote bag,softball tote bag,football tote bag,volleyball tote bag,basketball tote bag,soccer tote bag.Material: Cotton Canvas and Polyester,very durable. Canvas tote bag designs: magnetic closure lined with slip zipper pocket inside,Double riveted handles. Perfect for football games,sport coach,sport families,sports fans,sports team or anyone,Excellent gift idea for Birthday,Christmas,Thanks Giving,New Year,Congratulation,Graduation and other special occasions. Tote bag is great using for sports outdoors activities,ballgames,traveling,beach trip,daily using,school life,shopping and more. If you have any questions about this product by E-FirstFeeling, contact us by completing and submitting the form below. If you are looking for a specif part number, please include it with your message.